The Aztecs dominated Central America from the 14th to 16th centuries. They founded the magnificent floating city of Tenochtitlan (modern Mexico City) and – more importantly – were among the first people to make chocolate. We haven’t done much hands-on history lately, but discovering that the Aztecs used cacao beans as money captured our imaginations, and soon we were off on a delightful rabbit trail. Here are some of the activities we enjoyed during our hands-on Aztec history day. The Aztecs used a base 20 number system. Numbers were represented with combinations of dots and symbols, grouped together in any order. I printed out copies of how the Aztecs recorded numbers. We practised with this Aztec maths activity sheet, and then had fun writing number puzzles for each other. The Aztec calendar consisted of three calendar wheels. The two wheels of the religious calendar interlocked in 260 different combinations, making up the 260 day sacred calendar. The Aztecs also used a 365 day agricultural calendar. The two cycles together formed a 52 year “century”. 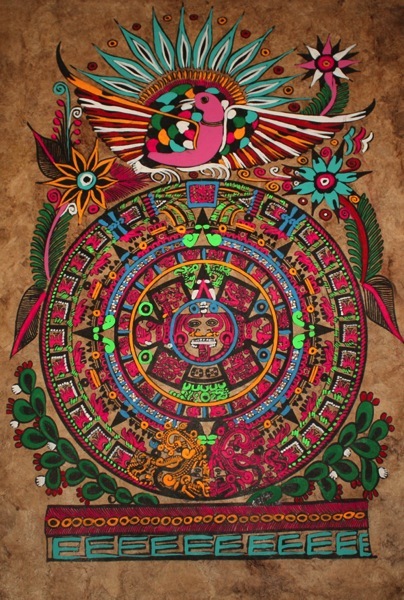 I’ve seen beautiful artwork based on the Aztec calendar and I was tempted to suggest that we have a go ourselves. But since we didn’t study how the calendar works in any detail, I didn’t want to dumb down a fascinating but complex subject with an over-simplified art project. We’ll enjoy exploring the maths of the Aztec calendar another time. Instead, we used this Aztec daysign calculator to find out which (of 20) Aztec daysigns we were born under. We coloured our daysign pictures with watercolour crayons. My kids love this sort of thing, and spent ages playing with the daysign calculator, working out the “daysign destinies” of everyone they know. C was amused to discover that the body part associated with her daysign – the vulture – is her right ear. The Aztecs were among the first people to mix ground cacao seeds with seasonings to make a spicy, frothy drink they called chocolatl. Cacao beans were such a luxury commodity that they were used as currency, so chocolatl was reserved for special occasions and important people. Have you ever wondered whether there’s a difference between cocoa and cacao? It seems that the word “cocoa” probably came about by mistake – a sort of linguistic typo that stuck. Today, we tend to refer to raw “cacao,” but processed “cocoa”. We watched this video about how cacao beans are harvested and processed. I like that it shows the cacao beans being pulled from the fruit. The next video shows how cacao beans are processed and made into chocolate bars. After watching all that chocolate being made, our mouths were watering. 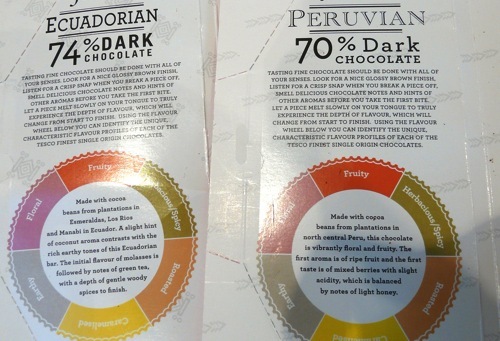 Tesco sells chocolate made with beans from individual named countries. Each bar even comes with accompanying tasting notes. I couldn’t find any Mexican chocolate, but we did taste chocolate from Dominican Republic and Ecuador. We used all our senses as we tasted, noticing how each type of chocolate looked, how it smelled, how it felt and sounded as it broke, and – of course – how it tasted. As we tasted each bar, we looked up where its beans came from on our world map. I recorded some of the children’s descriptions. J(8) described the chocolate from Côte d’Ivoire as “Nutty, creamy, and smooth”. C(10) thought it was “musty”! The children both liked the chocolate from Ecuador best. 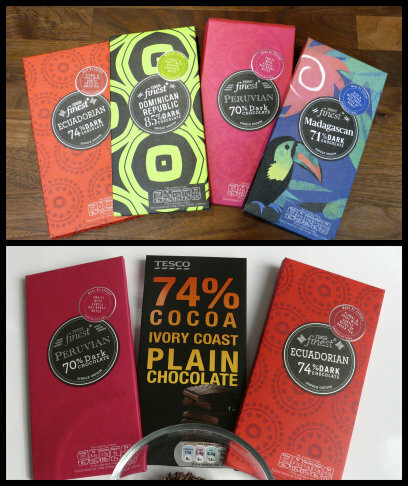 My favourite was the Peruvian chocolate, which tasted like berries. Cocoa nibs are small pieces of cacao beans that have been roasted and removed from their husks. Cocoa nibs can be eaten raw (we weren’t impressed), or added to recipes as a healthy chocolate substitute. 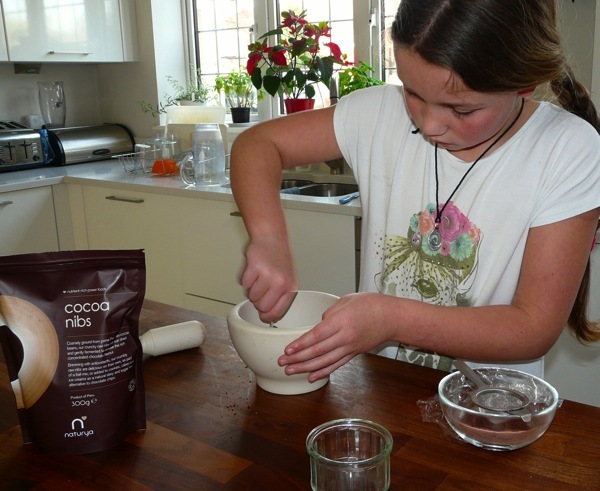 C(10) decided to grind a spoonful of cocoa nibs into powder using a pestle and mortar. An hour later, she had new-found respect for the people who used to do this before modern machines were invented! 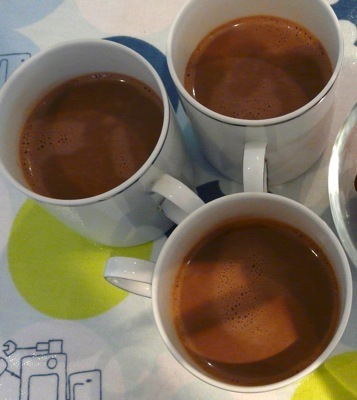 We drank Aztec-style hot chocolate for poetry tea. The recipe comes from the British Museum, but we were doubtful how closely this delicious beverage resembled the spicy drink consumed by rich Aztecs! I read Aztec poems as we enjoyed our hot chocolate, while J(8) entertained us with an old favourite, Michael Rosen’s Chocolate Cake. BBC Education (KS2) – The Aztec Empire – Good quality clips covering a variety of topics, including where the Aztecs came from and why they made human sacrifices (J(8)’s favourite). I so love this kind of learning! The chocolate tasting part is my favourite! Yum! What a ‘sensational’ study! LOL. I’m bookmarking this for when we study the Aztec. What fun! Love the combination of so many areas of study. It does always feel very satisfying to cover so many different skills when we’re learning about a fun topic, doesn’t it Carol? Waaaaahhhhh, I’m trying to pin it, and my computer isn’t letting me. Poor me. I love the Daysign part of your study, and any excuse to try chocolate. I love, love, love your studies. They are the perfect mixture of hands-on and research. Just my style. And, here, you have done all the work for me! I am pinning this for when we get back around to this. Ahh, thank you so much Phyllis! 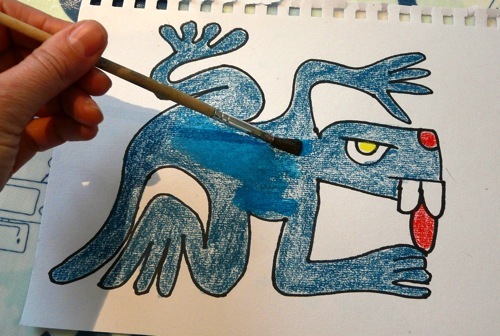 I’m doing the same with all your ancients projects. I have to concur with Mary. Chocolate would always be chosen over study (however wonderful) at this house! I love the art work you all created. A great study! And when eating chocolate is educational … well…! I know I’m being redundant, but what a great study!! I love every single aspect – how many areas can be explored with culture and history is so wonderful. I’ve never heard of Aztec daysigns – and I’m sure my girls would be just as interested as your kids. Maybe we should re-explore Mexico for a year… and properly learn about the Aztecs! Mexico was long before I started blogging – and I’m still so far behind putting up Greece, which we had looked at prior to China. Barring the tripe stew :), we had a lot of fun “in” Mexico…(no one ever lets me forget the tripe stew – which was apparently worse the 100 year old eggs) maybe when the girls outgrow my shananigans (so soon!) I can get my hands on my nephew and go back to Mexico! LOL! I remember the eggs… the tripe stew sounds hilarious. 😀 Your nephew is in for a treat! birthday banner – I saw an idea for a child’s first birthday to make a banner like mine but with a photo from each month of the first year … at that point, my children were toddlers so I changed the idea to be a photo for birth and then each year. I simply cut out a 5″ circle of card stock on my cricut machine … get a 5×7 photo printed and cut a 4.5″ circle out of the photo with my circle cutter and adhere it with scrapbooking glue … then tie the circles together with white thin ribbon. It is fun to see photos from the years as we celebrate their life! Can you tell I like paper crafts? … card making and scrapbooking … although I don’t get much time for that hobby these days! Thank you so much, Angie! Now I just need to dig out my pre-digital photos… I don’t have a cricut machine so my banner won’t be quite as snazzy as yours but I shall do my best. I know what you mean about time for hobbies. Between learning to play guitar, speak German and blogging (oh yes and homeschooling ;-)) everything else is a bit of a squeeze. All fun though. I’m thankful we had saved up money and purchased a nice digital camera the summer before my son (8) was born. That camera has taken thousands of photos but keeps on working! So all our photos of our kiddos are digital! My husband is a high school biology teacher, but we are homesteaders as a family. He hunts deer and turkey. We get our other meat, eggs and milk from a local farm. We either grow our fruit and vegetables (then freeze or can them) or pick them at a local farm. I bake all our bread products, granola bars, etc. All this plus cleaning/laundry and homeschooling keep my days full. But I love to create so I try to sneak in time for that. I just finished some wooden signs I’ve had in the thought process for too long! I’m hoping to get a picture posted today. I enjoy sewing, crocheting/knitting, card making, scrapbooking and just being creative. Plus to help with a little extra income, I have a small business where I take orders for sewn or crocheted items. oh but being at home serving my family and my God is the best place to be! You’re living the life I dream of! God is good … I’m so thankful for how He has brought us to this place in our lives. It is such a place of peace and content. Trust Him with your dream! What a beautiful sentiment, Angie. Wow!!! I am constantly amazed by the incredibly rich and full lives homeschooling mums live! Yours sounds busy – and idyllic. Your children are blessed with a wonderful role model. Thank you for taking the time to share some of what you do and inspire the rest of us here in blogland! Who would’ve ever thought that learning about the Aztecs would lead to watching videos about making chocolate! What a fun lesson! I know! When we came to the chapter in SOTW2, I thought we’d enjoy the read aloud and then zip on through (I think we might still be reading volume 2 when my kids leave home …). But how can you not stop and explore chocolate, really?! How perfect to tie in with Valentines, too! Thank you for hosting Wonderful Wednesdays. 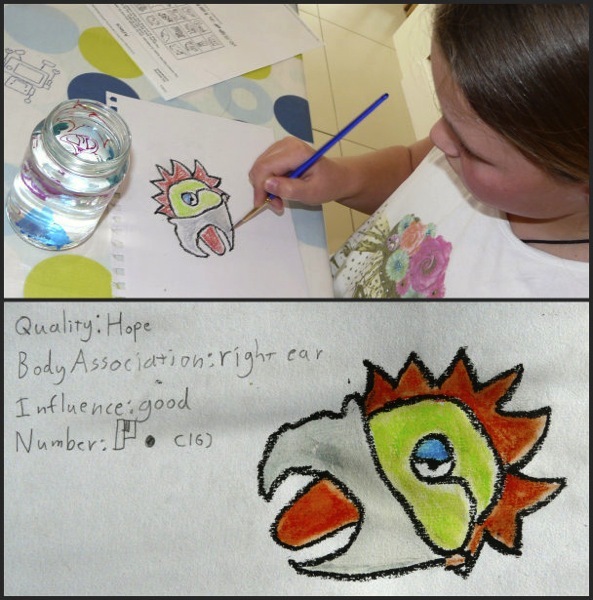 You’ve been featured on this month’s Creative Kids Culture Blog Hop! Can’t wait to see what you share this month! Thank you so much, Leanna. I love your hop!